What a great game last night. My daughters (4 years old) watched the entire game. We couldn’t get them away from the game, and that’s a long time to sit for football. Even though Seattle lost Super Bowl 49, the Seahawks did give us fuel to address a few parenting issues. Whether or not the pass to Ricardo Lockette was a mistake – this is only determined by Pete Carroll and Russell Wilson if you ask them the question “Whether they’d make the same play or whether they’d change it” If Butler hadn’t intercepted the ball – we’d be celebrating another Seahawks Super Bowl win. However that is not the case and the media and Seattle is reeling in “the biggest mistake ever” talk. I have always said to my previous students (Elementary and Secondary) and continue to say to my children that mistakes are a way of learning. We all have to make mistakes in order to learn. To quote Pete Carroll via LA Times he said “A very, very hard lesson, I hate to learn the hard way, but there’s no other way to look at it right now.” For our kids we can teach them, even superstars, celebrities, Presidents and especially adults make mistakes. It’s how we deal with them that is important. Immediately after the game, Pete Carroll told his players he was to blame. It was his mistake and he after all was Head Coach. Russell Wilson stood up and took the blame – stating it was him that threw the ball. This in my opinion helps children learn that if you make a mistake, own up to it and yes the backlash can be difficult but your honesty and integrity is more important. Our girls don’t watch TV. Sure they watch Amazon Prime, Xbox Videos, play IPad games etc. but they don’t see commercials. So what do we do when we watch live football as a family and the commercials come on? We use it as a learning experience. For example – the Budweiser advertisements (I’m so happy they didn’t have half naked women on them this year since that would be a deeper explanation than I could get through in 2 minutes). First, we explain what a commercial is? It’s a company’s way of trying to get us to buy their product. So we ask them “What is the Budweiser commercial trying to sell us?” They say beer. We ask “Do we need it or want it”. They say “No…Because you drink this beer”. When the car commercials come on – again we ask them “What are they trying to make us buy?” They will say a car. We say “Do we need it?” They say “No, we already have one”. When something scary comes on we do ask them to turn away and we do mute the sound. The reason is the girls get too scared and end up having nightmares. Yes the fists flying at the end is not something one wants to see on the field. But a great teaching moment – we told the girls even adults have trouble controlling their emotions (we have a 4 year old having trouble controlling her anger) but fighting is not the answer. We also illustrated that this was poor sportsmanship and asked what should he have done? The answers were “He should have walked away, gone to his room.” We also suggested – pounded the ground, screamed, gone to the locker room but not hit another person. Irvin did apologize today – closing the loop of what us parents with more than one child say when our kids fight – I’m sorry for hitting you. We can’t always win. At some point one has to teach children that sometimes we lose. Yes it’s awful but you need to lose in order to grow as a person. If a child never gets a toy taken away, or loses a debate, a game in school, or loses points on a test – how will that child develop into an adult and survive in the world. We have to feel the loss, learn from the mistakes, learn why we lost and get up and try again. We want our children not to give up on the challenges that they will face throughout their lifetime. These are some lessons we have been teaching/reinforcing in the last 24 hours. I would like to personally thank the Seattle Seahawks for playing with their hearts, servicing the community – especially Seattle Children’s Hospital and standing together as a great team. Learn from your games this year gentlemen and continue to strive for better next year. As a transplant from Toronto to Seattle, rooting for an NFL team – let alone standing in line for 12th man and Richard Sherman t-shirts last year prior to the Super Bowl – was not something I would normally do. I’m not sure if I’ve watched more than two Super Bowls in my life. But last year when the Seahawks headed to the Super Bowl all the transplants and all the natives of Seattle bonded together over this team. The Space Needle, Microsoft buildings, banks, high rises, construction cranes, bridges, boats on the lake etc. all displayed the Seahawks colors. It was an amazing sight of connectivity. I decided then that this is a team I needed to watch and to cheer for. Even more so when I see Russell Wilson volunteer his time to Seattle Children’s Hospital for kids struggling with cancer, and Richard Sherman visit children with physical disabilities. This is a unique team. A team like the Seahawks doesn’t come by very often. Pete Carroll must have read “Good to Great: Why Some Companies Make The Leap..And Others Don’t” by Jim Collins because he built an amazing team which has created a city full of committed fans, the 12’s. Last year my twin girls who were three wanted to watch the Super Bowl. I figured why not? They’d probably watch for a few minutes and then wander off. That didn’t happen. The girls were by my side the entire game. They are big fans of the Seahawks especially Richard Sherman. To this day they ask if Sherman is okay because in last year’s Super Bowl he hurt his ankle. All year they kept telling everyone “We watched the game but Sherman hurt his ankle… but he’s okay now”. For three year olds to remember this incident all year – he definitely left an impression. In the famous January 11, 2015 NFC championship game – Seahawks versus the Packers (the girls again glued to the game) learned a very valuable lesson: perseverance. We’ve had some issues with the girls stopping an activity when it gets difficult for them or if they get frustrated. Well – now when it happens we say – did the Seahawks give up when they were losing? They say no and continue to try, and persevere through the activity. Perseverance is a tough concept to teach to young kids but that game did it. I highly recommend that all kids and parents watch the game for a good lesson in perseverance. 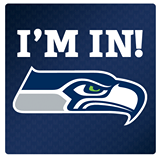 THANK YOU SEATTLE SEAHAWKS for showing all of us to believe in ourselves, in one’s team and not to give up when the stakes are down. 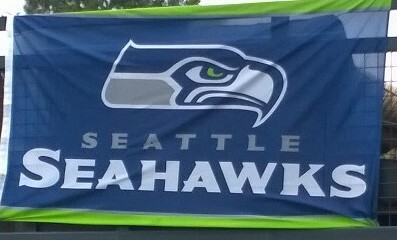 This East coast Canadian girl now has a Seahawks flag, Seahawks decal on her car, Seahawks napkins, and new Seahawks shirts for this Sunday’s Super Bowl XLIX.